Eggplant has been named a Leader in Gartner's 2018 Magic Quadrant for Software Test Automation. We believe this placement is based on the execution of our vision for AI-driven, technology, agnostic, cross-platform automated testing and for addressing the need for testing the actual user experience. Read more in this complimentary copy of the Magic Quadrant for Software Test Automation; now available for download. 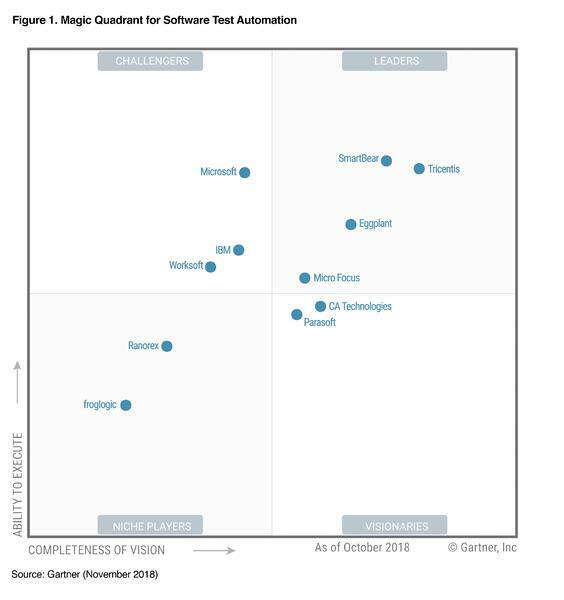 Gartner, Magic Quadrant for Software Test Automation, (Joachim Herschmann, Thomas Murphy, Jim Scheibmeir), (27 November 2018). This graphic was published by Gartner, Inc. as part of a larger research document and should be evaluated in the context of the entire document. The Gartner document is available upon request from Eggplant.